COLUMBUS, Ohio – Ohio State improved to 2-0 in Big Ten play with a 5-3 win over No. 22/20 Indiana Saturday afternoon at Buckeye Field. The Buckeyes are 17-9 overall while the Hoosiers have a 25-8 record with a 0-2 mark in conference action. RHP Lauren Rice took over in the circle in the top of the third and lasted the remaining 4.1 innings to earn her ninth win of the season. She gave up five hits but struck out one and kept the Hoosiers from scoring again. Bri Betschel got the Buckeyes going with a leadoff double to left center, her first of the year, in the bottom of the first. Lilli Piper kept the doubles coming with one of her own to drive Betschel in. Two walks and a steal stacked the bags before a wild pitch moved everyone up a base, giving Piper time to come in. A throwing error by Indiana’s pitcher allowed Niki Carver to get on while a pair of runs crossed home plate. The final tally came off Claire Nicholson’s bat, a RBI single to center field, putting OSU ahead 5-0. The Hoosiers joined the scoring in the top of the second on a Buckeye miscue. A two-RBI single by Grayson Radcliffe helped IU pull within two, 5-3. Both teams fought to put more runs on the scoreboard but it was a tale of solid defense for the rest of the game as Piper and Carley Gaskill turned a double play to end to game. 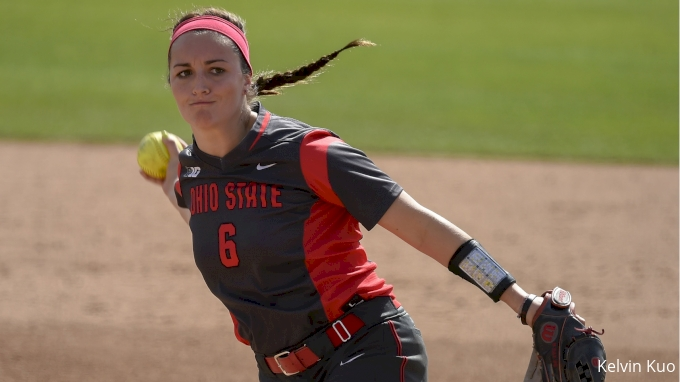 Kat Duvall was Ohio State’s starting pitcher, allowing three runs (two earned), three hits with three strikeouts. Betschel tallied a career-high three hits and scored a run. Piper was a perfect 3-for-3 with one RBI, a run scored and stolen base. Five different Buckeyes crossed home plate. Piper is on a five-game hitting streak. Rice has both wins against the Hoosiers this weekend.